Shipley Law Firm & Title Company is pleased to provide the highest quality, professional legal services for clients in Lake County and throughout central Florida. The firm's attorneys are experienced in representing individuals and businesses in the areas of bankruptcy law, business and corporate law, civil litigation, family law, wills, trusts and estate planning, probate, and real estate law (including real estate closings and title insurance). Our firm offers comprehensive analyses of all debt relief and debt workout options including skilled and cost-effective legal representation in all types of Chapter 7, Chapter 13, and Chapter 11 bankruptcy law matters. Our Lake County bankruptcy lawyers are dedicated to finding the best possible financial solution for our clients, which financial solution may or may not include bankruptcy. If you need legal assistance with a business and corporate law or civil litigation matter, Shipley Law Firm & Title Company can help. The firm has for many years represented clients in matters involving business formation, commercial lease agreements, and the purchase and sale of businesses and real estate. We also represent clients in business and corporate disputes involving breach of contract, unfair competition, fraud, landlord-tenant issues and employment. Whenever possible, we try to resolve disputes through alternative dispute resolution to avoid the time and expense of trial. However, when necessary we will aggressively defend your interests in litigation. Shipley Law Firm & Title Company provides legal services related to wills, trusts and estate planning to ensure peace of mind for you and your loved ones. Our firm can draft and reviewing wills and trust documents as well as identify and implement asset protection strategies for Medicaid, to minimize estate and probate taxes, and plan for potential creditor's claims. At Shipley Law Firm & Title Company, we provide family law services related to adoption, dissolution of marriage/divorce, child custody, child support, post-dissolution modifications, spousal support/alimony, and ante-nuptial/prenuptial and post-nuptial agreements. We guide prospective adoptive parents through the complicated Florida adoption process and help file the necessary paperwork with the court. Our firm also guides clients through the difficult legal process of divorce and assists with the drafting and review of ante-nuptial/prenuptial and post-nuptial agreements. Shipley Law Firm & Title Company has also successfully represented clients in a variety of real estate matters related to closings, title insurance, easement disputes, title insurance claims, deed restrictions, enforcing real estate contracts, evictions and landlord-tenant litigation, homeowners associations, foreclosures, boundary disputes and quiet title actions. Lake County bankruptcy attorney Christopher J. Shipley received both a Master's Degree in Business Administration (M.B.A.) concentrating in Entrepreneurship and a Juris Doctor (J.D.) degree from Florida State University. He is also licensed as a Florida Certified Public Accountant and is a member of many professional organizations, including the American Bar Association, the American Institute of Certified Public Accountants, the Florida Institute of Certified Public Accountants, REALTORS® Association of Lake & Sumter Counties, Inc., the Lake County Bar Association, Orange County Bar Associations, National Association of Consumer Bankruptcy Attorneys (NACBA), n and the Central Florida Bankruptcy Law Association (CFBLA). Mr. Shipley also served in the United States Army Reserve for eight years and was on active wartime duty during the Persian Gulf War. 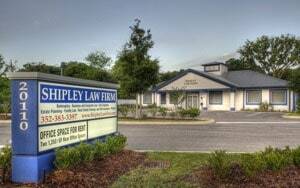 Shipley Law Firm & Title Company is conveniently located in Mount Dora, Florida near the border of Lake County and Orange County. To schedule an initial consultation with Lake County bankruptcy lawyer Christopher J. Shipley, Esq., or one of the other attorneys of the firm, please call (352) 383-3397 or fill out and submit our online Contact Us page. We look forward to assisting you.